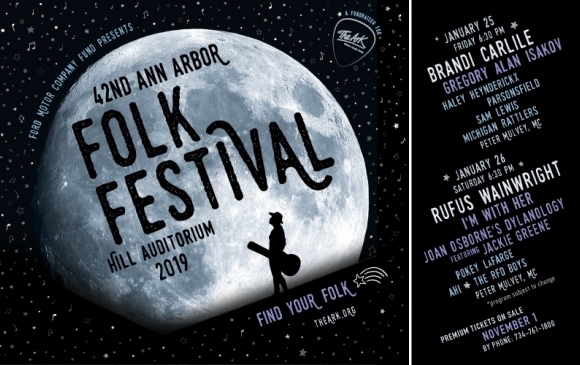 The annual Ann Arbor Folk Festival is a fundraiser for The Ark that takes place in Hill Auditorium with two entertaining nights filled with the best folk music around. For the 42nd Folk Fest, the first night on Friday, January 25 features Brandi Carlile, Gregory Alan Isakov, Haley Heynderickx, Sam Lewis, Parsonsfield, Michigan Rattlers, and Peter Mulvey. Then, the folk fun continues on Saturday, January 26 with the exciting lineup of Rufus Wainwright, I’m With Her, Pokey Lafarge, Ahi, The RFD Boys, and Peter Mulvey. Tickets can be bought at MUTO in the League Underground, at the Ark box office, or online at www.theark.org.